The two Port OC-48/STM-16 Trunk Module is ideal for connecting any of Media Links’ MD8000 devices to SONET/SDH networks at rates of 622Mbps (581.068 Mbps effective). Using a non-blocking Layer 2 Switch Fabric, Ethernet frames from an OC-48/STM-16 Trunk Module are sent to the dual Switch Controllers (SW-CNT modules) across the chassis backplane. For route diversity, this trunk module is equipped with dual SONET/SDH interfaces. For efficient multiplexing and easy integration with carrier IP networks, the trunk card supports the ITU G.7041 Generic Framing Procedure (GFP). For optimal core network utilization and multi-service termination on a single trunk port, several STS/VC concatenation are supported, including STS12c x 2 Ports (SONET), VC4-4c x 2 Ports (SDH), 4 x STS3c x 2 Ports (SONET0, and 4 x VC4 x 2 ports (SDH). 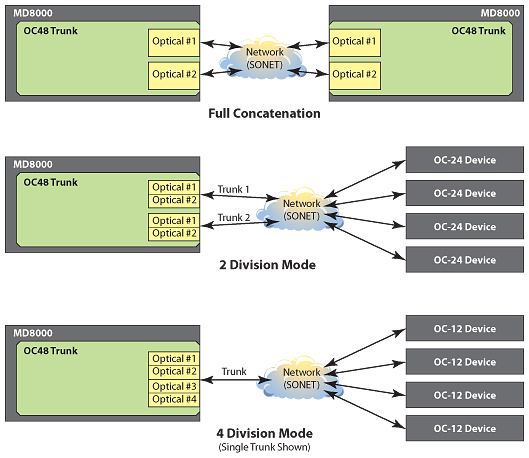 Additional supported modes (STS Model) include a combined mode of one port of STS12c (SONET) with the second port supporting logical paths of 12 x STS1 x 1 (SONET). The two Port OC-3/STM-1 Trunk Module accepts small form factor pluggable (SFP) optics to support optical budgets of 10km, 40km, 80km and 120km. Newer SONET/SDH compatible wavelength division multiplexing technologies such as CWDM/DWDM are also fully supported.